The analysis in this report is based on two nationally representative online surveys conducted by Pew Research Center. The general public survey (Sample 1) was conducted Nov. 17-Dec. 1, 2016, among a sample of 2,029 adults 18 years of age or older. 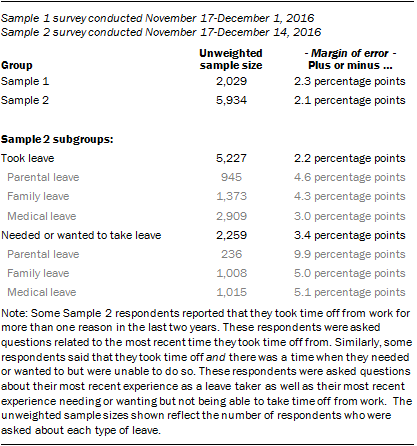 The survey of adults who took or needed or wanted to take leave (Sample 2) was conducted Nov. 17-Dec. 14, 2016, among 5,934 adults ages 18 to 70 who were employed for pay at some point in the past two years and who took – or who needed or wanted but were unable to take – time off from work following the birth or adoption of their child (parental leave), to care for a family member with a serious health condition (family leave), or to deal with their own serious health condition (medical leave) during that time. Both surveys were conducted by the GfK Group in English and Spanish using KnowledgePanel, its nationally representative online research panel. KnowledgePanel members are recruited through probability sampling methods and include both those with internet access and those who did not have internet access at the time of their recruitment (KnowledgePanel provides internet access for those who do not have it and, if needed, a device to access the internet when they join the panel). A combination of random-digit dialing (RDD) and address-based sampling (ABS) methodologies have been used to recruit panel members (in 2009 KnowledgePanel switched its sampling methodology for recruiting panel members from RDD to ABS). The panel includes households with landlines and cellular phones, including those only with cell phones, and those without a phone. Both the RDD and ABS samples were provided by Marketing Systems Group (MSG). KnowledgePanel continually recruits new panel members throughout the year to offset panel attrition as people leave the panel. All active members of the GfK panel were eligible for inclusion in this study. In all, 3,268 panelists were invited to take part in the Sample 1 survey and 36,488 panelists were invited to take part in the screener for the Sample 2 survey. All sampled members received an initial email to notify them of the survey and provide a link to the survey questionnaire. Additional follow-up reminders were sent to those who had not yet responded as needed. The final samples of 2,029 adults for Sample 1 and 5,934 adults for Sample 2 were each weighted using an iterative technique that matches gender, age, race, Hispanic origin, education, region, household income, home ownership status and metropolitan area to parameters from the Census Bureau’s March 2016 Current Population Survey (CPS). This weight is multiplied by an initial sampling or base weight that corrects for differences in the probability of selection of various segments of GfK’s sample and by a panel weight that adjusts for any biases due to nonresponse and noncoverage at the panel recruitment stage (using all of the parameters described above). Sampling errors and statistical tests of significance take into account the effect of weighting at each of these stages.